^ a b c d Nash, Clinton S. (2005). “Atomic and Molecular Properties of Elements 112, 114, and 118”. Journal of Physical Chemistry A 109 (15): 3493–3500. doi:10.1021/jp050736o. PMID 16833687. ^ a b c d e Kaldor, Uzi; Wilson, Stephen (2003). Theoretical Chemistry and Physics of Heavy and Superheavy Elements. Springer. p. 105. ISBN 140201371X. http://books.google.com/books?id=0xcAM5BzS-wC&printsec=frontcover&dq=element+118+properties#PPA105,M1 2008年1月18日閲覧。. ^ a b Seaborg, Glenn Theodore (1994). Modern Alchemy. World Scientific. p. 172. ISBN 9810214405. http://books.google.com/books?id=e53sNAOXrdMC&printsec=frontcover#PPA172,M1 2008年1月18日閲覧。. ^ Oganessian, Yu. Ts. ; Utyonkov, V.K. ; Lobanov, Yu.V. ; Abdullin, F.Sh. ; Polyakov, A.N. ; Sagaidak, R.N. ; Shirokovsky, I.V. ; Tsyganov, Yu.S. ; Voinov, Yu.S. ; Gulbekian, G.G. ; Bogomolov, S.L. ; B. N. Gikal, A. N. Mezentsev, S. Iliev; Subbotin, V.G. ; Sukhov, A.M.; Subotic, K; Zagrebaev, V.I. ; Vostokin, G.K.; Itkis, M. G.; Moody, K.J; Patin, J.B.; Shaughnessy, D.A. ; Stoyer, M.A. ; Stoyer, N.J.; Wilk, P.A. ; Kenneally, J.M. ; Landrum, J.H. ; Wild, J.H. ; and Lougheed, R.W. (2006-10-09). “Synthesis of the isotopes of elements 118 and 116 in the 249Cf and 245Cm+48Ca fusion reactions”. Physical Review C 74 (4): 044602. doi:10.1103/PhysRevC.74.044602. http://link.aps.org/abstract/PRC/v74/e044602 2008年1月18日閲覧。. ^ a b c d e f g h i j k l Nash, Clinton S. (2005). "Atomic and Molecular Properties of Elements 112, 114, and 118". Journal of Physical Chemistry A. 109 (15): 3493–3500. Bibcode:2005JPCA..109.3493N. doi:10.1021/jp050736o. PMID 16833687. ^ a b Fricke, Burkhard (1975). "Superheavy elements: a prediction of their chemical and physical properties". Recent Impact of Physics on Inorganic Chemistry. 21: 89–144. doi:10.1007/BFb0116498. Retrieved 4 October 2013. ^ a b Smolanczuk, R. (1999). “Production mechanism of superheavy nuclei in cold fusion reactions”. Physical Review C 59 (5): 2634–2639. Bibcode: 1999PhRvC..59.2634S. doi:10.1103/PhysRevC.59.2634. ^ Ninov, Viktor (1999). “Observation of Superheavy Nuclei Produced in the Reaction of 86Kr with 208Pb”. Physical Review Letters 83 (6): 1104–1107. Bibcode: 1999PhRvL..83.1104N. doi:10.1103/PhysRevLett.83.1104. ^ Dalton, R. (2002). “Misconduct: The stars who fell to Earth”. Nature 420 (6917): 728–729. Bibcode: 2002Natur.420..728D. doi:10.1038/420728a. PMID 12490902. ^ Zagrebaev, Valeriy; Karpov, Alexander; Greiner, Walter (2013). “Future of superheavy element research: Which nuclei could be synthesized within the next few years?”. Journal of Physics (IOP Publishing Ltd) 420: 012001. arXiv:1207.5700. doi:10.1088/1742-6596/420/1/012001. http://nrv.jinr.ru/pdf_file/J_phys_2013.pdf. ^ Oganessian, Yu. T. (2002). “Results from the first 249Cf+48Ca experiment”. JINR Communication (JINR, Dubna). http://www.jinr.ru/publish/Preprints/2002/287(D7-2002-287)e.pdf. ^ a b Moody, Ken. “Synthesis of Superheavy Elements”. In Schädel, Matthias; Shaughnessy, Dawn. The Chemistry of Superheavy Elements (2nd ed.). Springer Science & Business Media. pp. 24–8. ISBN 9783642374661. ^ Oganessian, Yu. T. (2006). “Synthesis and decay properties of superheavy elements”. Pure Appl. Chem. 78 (5): 889–904. doi:10.1351/pac200678050889. ^ Sanderson, K. (2006). “Heaviest element made – again”. Nature News (Nature). doi:10.1038/news061016-4. ^ a b c d e Oganessian, Yu. Ts. ; Utyonkov, V. K.; Lobanov, Yu. V.; Abdullin, F. Sh. ; Polyakov, A. N.; Sagaidak, R. N.; Shirokovsky, I. V.; Tsyganov, Yu. S.; et al. (2006-10-09). "Synthesis of the isotopes of elements 118 and 116 in the 249Cf and 245Cm+48Ca fusion reactions". Physical Review C. 74 (4): 044602. Bibcode:2006PhRvC..74d4602O. doi:10.1103/PhysRevC.74.044602. Retrieved 2008-01-18. ^ Jacoby, Mitch (17 October 2006). “Element 118 Detected, With Confidence”. Chemical & Engineering News. https://pubs.acs.org/cen/news/84/i43/8443element118.html 2008年1月18日閲覧. ""I would say we're very confident."" ^ a b c d Chowdhury, Roy P.; Samanta, C.; Basu, D. N. (2006). “α decay half-lives of new superheavy elements”. Phys. Rev. C 73: 014612. arXiv:nucl-th/0507054. Bibcode: 2006PhRvC..73a4612C. doi:10.1103/PhysRevC.73.014612. ^ Oganessian, Yu. Ts. ; Utyonkov, V.; Lobanov, Yu. ; Abdullin, F.; Polyakov, A.; Shirokovsky, I.; Tsyganov, Yu. ; Gulbekian, G. et al. (2004). “Measurements of cross sections and decay properties of the isotopes of elements 112, 114, and 116 produced in the fusion reactions 233,238U, 242Pu, and 248Cm+48Ca”. Physical Review C 70 (6): 064609. Bibcode: 2004PhRvC..70f4609O. doi:10.1103/PhysRevC.70.064609. ^ Samanta, C.; Chowdhury, R. P.; Basu, D.N. (2007). “Predictions of alpha decay half-lives of heavy and superheavy elements”. Nucl. Phys. A 789: 142–154. arXiv:nucl-th/0703086. Bibcode: 2007NuPhA.789..142S. doi:10.1016/j.nuclphysa.2007.04.001. ^ Karol, Paul J.; Barber, Robert C.; Sherrill, Bradley M.; Vardaci, Emanuele; Yamazaki, Toshimitsu (29 December 2015). “Discovery of the element with atomic number Z = 118 completing the 7th row of the periodic table (IUPAC Technical Report)”. Pure Appl. Chem. 88 (1–2): 155–160. doi:10.1515/pac-2015-0501. https://www.degruyter.com/downloadpdf/j/pac.2016.88.issue-1-2/pac-2015-0501/pac-2015-0501.pdf 2016年4月2日閲覧。. ^ Chatt, J. (1979). “Recommendations for the Naming of Elements of Atomic Numbers Greater than 100”. Pure Appl. Chem. 51 (2): 381–384. doi:10.1351/pac197951020381. ^ Wieser, M.E. (2006). “Atomic weights of the elements 2005 (IUPAC Technical Report)”. Pure Appl. Chem. 78 (11): 2051–2066. doi:10.1351/pac200678112051. ^ Koppenol, W. H. (2002). “Naming of new elements (IUPAC Recommendations 2002)”. Pure and Applied Chemistry 74 (5): 787–791. doi:10.1351/pac200274050787. http://media.iupac.org/publications/pac/2002/pdf/7405x0787.pdf. ^ Koppenol, Willem H.; Corish, John; García-Martínez, Javier; Meija, Juris; Reedijk, Jan (2016). “How to name new chemical elements (IUPAC Recommendations 2016)”. Pure and Applied Chemistry 88 (4). doi:10.1515/pac-2015-0802. ^ de Marcillac, P.; Coron, N.; Dambier, G.; Leblanc, J.; Moalic, J.-P. (2003). “Experimental detection of α-particles from the radioactive decay of natural bismuth”. Nature 422 (6934): 876–878. Bibcode: 2003Natur.422..876D. doi:10.1038/nature01541. PMID 12712201. 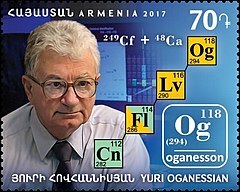 ^ Oganessian, Yu. Ts. ; Sobiczewski, A.; Ter-Akopian, G. M. (9 January 2017). “Superheavy nuclei: from predictions to discovery”. Physica Scripta 92: 023003-1–21. doi:10.1088/1402-4896/aa53c1. ^ Oganessian, Yu. T. (2007). “Heaviest nuclei from 48Ca-induced reactions”. Journal of Physics G: Nuclear and Particle Physics 34 (4): R165–R242. Bibcode: 2007JPhG...34..165O. doi:10.1088/0954-3899/34/4/R01. ^ Chowdhury, Roy P.; Samanta, C.; Basu, D. N. (2008). “Search for long lived heaviest nuclei beyond the valley of stability”. Physical Review C 77 (4): 044603. arXiv:0802.3837. Bibcode: 2008PhRvC..77d4603C. doi:10.1103/PhysRevC.77.044603. ^ Chowdhury, R. P.; Samanta, C.; Basu, D.N. (2008). “Nuclear half-lives for α -radioactivity of elements with 100 ≤ Z ≤ 130”. Atomic Data and Nuclear Data Tables 94 (6): 781–806. arXiv:0802.4161. Bibcode: 2008ADNDT..94..781C. doi:10.1016/j.adt.2008.01.003. ^ a b Royer, G.; Zbiri, K.; Bonilla, C. (2004). “Entrance channels and alpha decay half-lives of the heaviest elements”. Nuclear Physics A 730 (3–4): 355–376. arXiv:nucl-th/0410048. Bibcode: 2004NuPhA.730..355R. doi:10.1016/j.nuclphysa.2003.11.010. ^ Duarte, S. B.; Tavares, O. A. P.; Gonçalves, M.; Rodríguez, O.; Guzmán, F.; Barbosa, T. N.; García, F.; Dimarco, A. (2004). “Half-life predictions for decay modes of superheavy nuclei”. Journal of Physics G: Nuclear and Particle Physics 30 (10): 1487–1494. Bibcode: 2004JPhG...30.1487D. doi:10.1088/0954-3899/30/10/014. http://www.iaea.org/inis/collection/NCLCollectionStore/_Public/36/073/36073846.pdf. ^ Landau, Arie; Eliav, Ephraim; Ishikawa, Yasuyuki; Kador, Uzi (25 May 2001). “Benchmark calculations of electron affinities of the alkali atoms sodium to eka-francium (element 119)”. Journal of Chemical Physics 115 (6): 2389–92. Bibcode: 2001JChPh.115.2389L. doi:10.1063/1.1386413. https://www.researchgate.net/profile/Ephraim_Eliav2/publication/234859102_Benchmark_calculations_of_electron_affinities_of_the_alkali_atoms_sodium_to_eka-francium_(element_119)/links/00b4951b1c7eb49ffc000000.pdf 2015年9月15日閲覧。. ^ Goidenko, Igor; Labzowsky, Leonti; Eliav, Ephraim; Kaldor, Uzi; Pyykkö, Pekka (2003). “QED corrections to the binding energy of the eka-radon (Z=118) negative ion”. Physical Review A 67 (2): 020102(R). Bibcode: 2003PhRvA..67b0102G. doi:10.1103/PhysRevA.67.020102. ^ Eliav, Ephraim; Kaldor, Uzi; Ishikawa, Y.; Pyykkö, P. (1996). “Element 118: The First Rare Gas with an Electron Affinity”. Physical Review Letters 77 (27): 5350–5352. Bibcode: 1996PhRvL..77.5350E. doi:10.1103/PhysRevLett.77.5350. PMID 10062781. ^ Seaborg, Glenn Theodore (1994). Modern Alchemy. World Scientific. p. 172. ISBN 981-02-1440-5. ^ Takahashi, N. (2002). “Boiling points of the superheavy elements 117 and 118”. Journal of Radioanalytical and Nuclear Chemistry 251 (2): 299–301. doi:10.1023/A:1014880730282. ^ Nash, Clinton S.; Bursten, Bruce E. (1999). “Spin-Orbit Effects, VSEPR Theory, and the Electronic Structures of Heavy and Superheavy Group IVA Hydrides and Group VIIIA Tetrafluorides. A Partial Role Reversal for Elements 114 and 118”. Journal of Physical Chemistry A 1999 (3): 402–410. Bibcode: 1999JPCA..103..402N. doi:10.1021/jp982735k. ^ a b Han, Young-Kyu; Lee, Yoon Sup (1999). “Structures of RgFn (Rg = Xe, Rn, and Element 118. n = 2, 4.) Calculated by Two-component Spin-Orbit Methods. A Spin-Orbit Induced Isomer of (118)F4”. Journal of Physical Chemistry A 103 (8): 1104–1108. Bibcode: 1999JPCA..103.1104H. doi:10.1021/jp983665k. ^ Pitzer, Kenneth S. (1975). “Fluorides of radon and element 118”. Journal of the Chemical Society, Chemical Communications (18): 760–761. doi:10.1039/C3975000760b. ^ 张青莲 (November 1991) (中国語). Beijing: Science Press. pp. P72. ISBN 7-03-002238-6.